While most people tend to focus on the signs of aging that appear on the face, if the thin skin of the neck becomes lax or rough over time, it can make the face look older as well. A surgical neck lift improves the neck and revitalizes one’s appearance, but not everyone has the time to undergo a surgical procedure that requires downtime. Patients with mild skin laxity, fine lines and wrinkles, blotchy pigmentation, blotchy redness or pockets of fat just under the chin may better benefit from non-surgical, less invasive treatments, many of which can be combined for even more effective, longer lasting results. 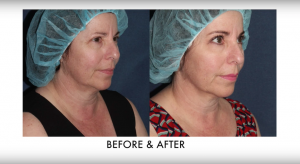 The board-certified dermatologists at Cosmetic Laser Dermatology in sunny San Diego are experts in a wide range of non-surgical options for revitalizing the appearance of the neck. Contact us today to learn how we can help revitalize your appearance. At Cosmetic Laser Dermatology, we offer safe and effective neck rejuvenation therapies that are designed to smooth wrinkles and tighten skin. These therapies range from laser treatments to combination therapies and more. During an initial consultation with our skincare experts, we will work with your particular goals and desires to choose a treatment therapy that’s ideal for you! The PicoWay laser is ideal for erasing pigmented lesions or unwanted skin discoloration and revitalizing the neck by improving texture and abnormal pigmentation. The 755 nm PicoSure laser (with options for 532 nm or 1064 nm wavelengths) is used to address skin discoloration, pigmented lesions, and scarred or dulled skin. The dual wavelength Fraxel laser (an improved erbium laser at 1550 nm and a thulium laser at 1927 nm) can correct skin discoloration, scarring, wrinkles, lax skin, and rough texture with precision. Intense pulsed light (IPL) is a gentle, non-ablative broad-spectrum light treatment that can be customized to suit each patient’s unique needs and skin type. It’s safe and effective for improving sun-damaged skin, age/sun spots, discoloration, pigmented lesions, and redness. Cosmetic Laser Dermatology’s very own Dr. Mitchel Goldman is a leading industry expert in laser research and therapy. He was part of a team that conducted a study not long ago on the neck rejuvenating effects of a combination CO2/Er:YAG laser treatment. Both CO2 and Er:YAG laser treatments provide variable results for the neck as standalone therapies. Dr. Goldman’s study, however, showed that the combination CO2/Er:YAG laser treatment procedure resulted in more improvement and less damage. Skin texture and fine wrinkles were more noticeably improved for up to 6 months. There were also virtually no side effects such as hypopigmentation and scarring. Thermage uses radiofrequency (RF) energy to tighten lax skin. It also implements a unique mechanism to keep the skin surface cool during treatment for a safer, more comfortable experience. The RF energy penetrates deep to ramp up the production of collagen and elastin to give your neck skin a fuller, more youthful appearance. By adding support to the skin’s foundational structure, the skin looks and feels smoother. Learn more about Thermage neck tightening treatments at Thermage.com. ThermiTight also uses RF energy to revitalize lax neck skin and rough texture. It is a minimally invasive procedure that utilizes a small cannula inserted under the skin to deliver RF energy. ThermiTight treatment increases collagen and elastin production, which helps smooth wrinkles and tighten lax skin. The result is plumper, smoother, firmer skin. Ultherapy is the only device FDA-cleared to lift the lax neck skin. It uses focused ultrasound to improve lax skin and stimulate collagen production. The ultrasound energy gently penetrates the skin to repair and augment the structure of the skin. Ultherapy has adjustable settings for treatment that is so precise that it can be customized. The non-surgical procedure does not require incisions, so there’s no scarring and virtually no downtime necessary. Neck rejuvenation is gradual and natural-looking and the effects last for more than a year. Minimal side effects could occur, including redness, swelling, and tenderness. To enhance the effects of Ultherapy, it can be combined with Botox for improved smoothness. Platysmal bands are muscles in the front part of the neck that can become more prominent as people age due to the increased muscle size due to constant use. When one’s neck skin loses laxity and becomes thin, these bands become even more prominent and betray an otherwise younger appearance. Botox injections relax these muscles so that these bands are less prominent, resulting in smoother skin and a fresher looking neck for up to 6 months. Belotero is a soft dermal filler made of hydrating hyaluronic acid, which is ideal for smoothing wrinkles and plumping the skin. Our dermatology experts dilute it with a 1:1 ratio of saline, which reduces the lines, adds volume and volumizes the entire chin, jawline, and neck. The thinner properties of Belotero make it more lightweight than other HA fillers, so it can be injected at a superficial level into the thin, fragile skin of the neck. Belotero improves skin elasticity and limits side effects, such as the formation of skin bumps. 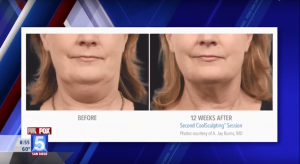 Kybella is FDA-approved method of removing submental fat under the chin by dissolving fat cells. The injections contain deoxycholic acid, a substance that breaks down fat so the body can reabsorb and dispose of the damaged cells. 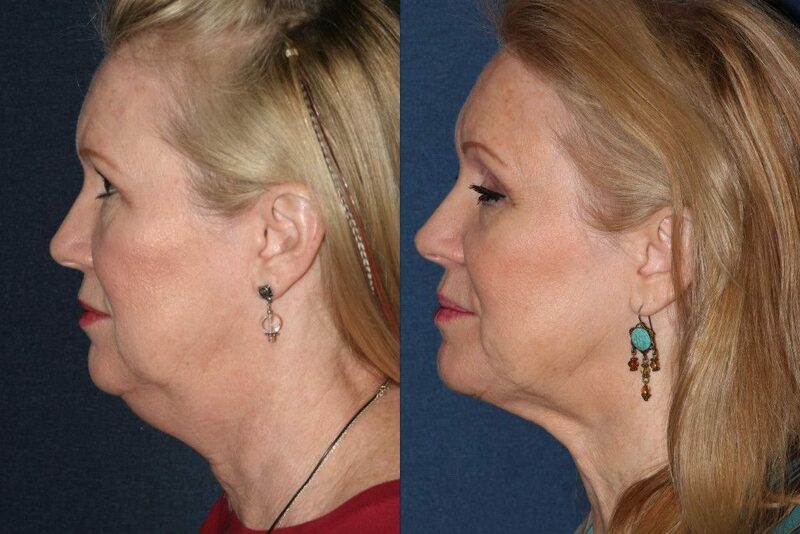 The result is a more defined neck profile and overall neck rejuvenation. Keep in mind, though, that Kybella is not intended for lax skin but instead for fatty pockets of skin. On its own, this neck filler treatment can last up to 12 months. In combination with another treatment, such as Botox or Ultherapy, the results can look better and last longer. In addition to the minimally-invasive neck rejuvenation treatments offered at our center, we also offer a variety of medical grade skincare creams that provide noticeable revitalizing effects on the neck. Formulated with proprietary technology that includes Processed Skin Cell Proteins that nourish and heal the skin. SENTÉ’s the active ingredient is heparan sulfate, which is known for its moisturizing properties that smooth rough skin texture, add firmness, and provide more elasticity. It also has antioxidants that regenerate tissue and replenish moisture for youthful-looking neck rejuvenation. TNS Recovery Complex from SkinMedica helps tone and repair dull or lax neck skin when applied twice a day. This treatment was developed in part by our very own Dr. Mitchel Goldman!